I've been asked that question a number of times, mostly by my non-photo hobby friends who think my analog photography passion is quaint and are somewhat amused by my desire to use old film cameras when it's far easier and more convenient to take pictures with a smartphone. No matter if they're just making conversation or are truly interested, it is a question I find difficult to answer. I will try here. The Nikon F2 is a favorite because it has real sentimental value to me. It's the 70 era SLR that I dreamed of owning as a teenager and it's the first SLR that I bought when I started getting serious about film photography again in 2010. But as I've started to hike more and carry a camera with me all of the time, the F2 is a bit big and heavy. And, after my cataract surgery and a return to better eyesight, I am having difficulty with the F2's standard diopter setting. This can be easily remedied with a screw on diopter lens, I just have to get serious about finding the right one for my new eyes. I bought my RX because it was the most affordable way to try Carl Zeiss lenses. I didn't expect that I would like shooting it as much as I do. The RX is a 1990s era technical marvel and I worry that if its electronics start to fail, it might be too expensive to fix. That'll mean either picking up another body or finding another platform for my Zeiss Planar lens. 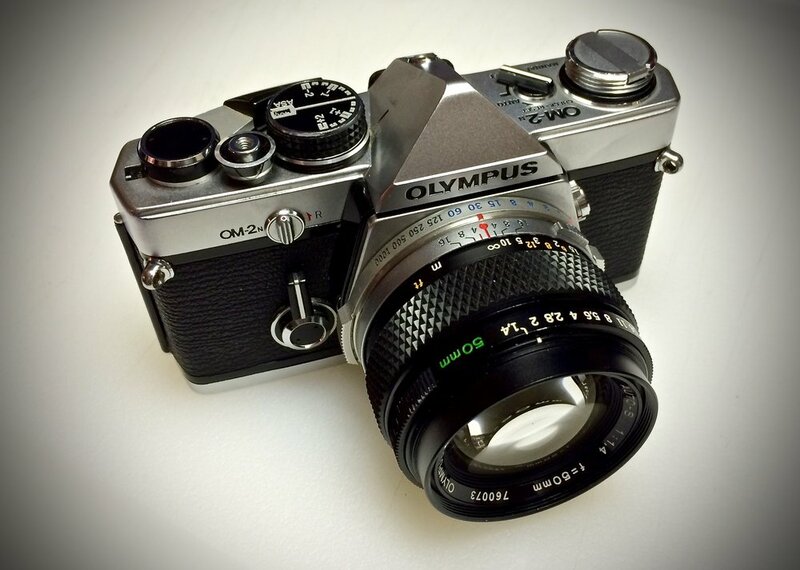 I'll put my OM-2n cameras aside for nearly a year and sometimes even think about selling them. Then, I will read a review or user report online and it'll get me excited about shooting mine again. Every time I use the OM-2n it's a hoot and I'm glad I've kept them. Ok, I'll admit it. I have a bit of a Spotmatic problem. I have, I think...like a dozen or so now and one by one, they're all going off to Eric Hendrickson for CLA. My addiction is fed by my Pentax pusher, a friend who used to work for the factory and, over the years, assembled a nice collection of hardly used Spotmatic and other film-era Pentax bodies. Somehow, he knows just the right cadence of when to send me an email with a photo or two of yet another wonderful old Pentax that needs a new home. So, as he wisely thins his own herd, my shelves fill. 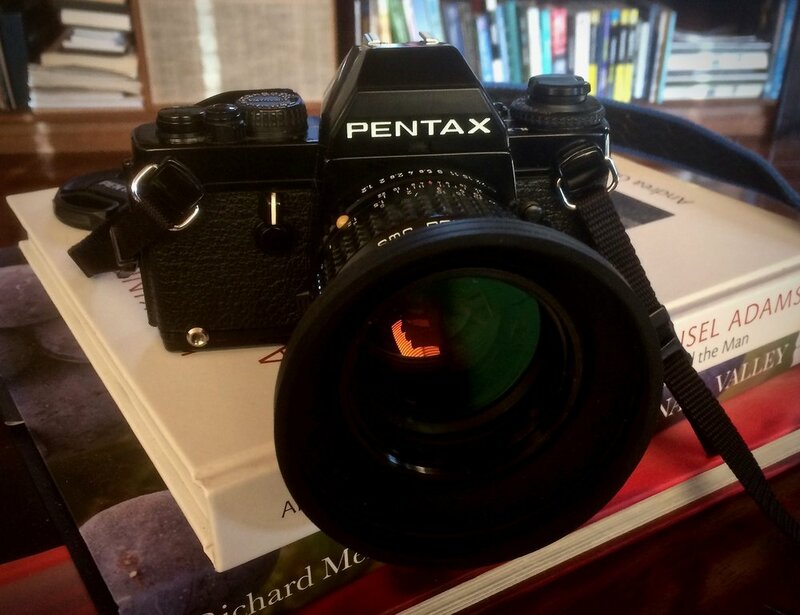 This simple Pentax SLR has been the most pleasant surprise of my film photography adventure. A joy to shoot. Simple. Dependable. And the M42 mount Takumar lenses for these bodies are superb! No one in their right mind needs so many of the same thing, so I will be selling off some of these. If you or someone you know wants a very, very nice fully serviced Spotmatic, drop me a line. I expected this Canon to come and go, but each time I use it, I like it a little more. The metering is really precise and I am quite blown away by the sharpness of these affordable Canon FD lenses. Like the Nikon F2, it is a bit heavy to carry all day in the field, but once you see the images this camera produces, it makes carrying it seem worthwhile. As I Nikon guy, I had always looked down on Canon. This camera changed my mind. I bought an MX early in 2017, took it on Carmel photo shoot and sold it a few months later for a nice profit on eBay. As I was going through images for my Lightbox Wednesday project, I went through those Carmel photographs and realized how nicely this simple little manual everything SLR with an inexpensive SMC 50mm f/1.7 lens performed. The MX is the first camera that I bought, sold, regretted my decision and then went and found another. Well, I found two. 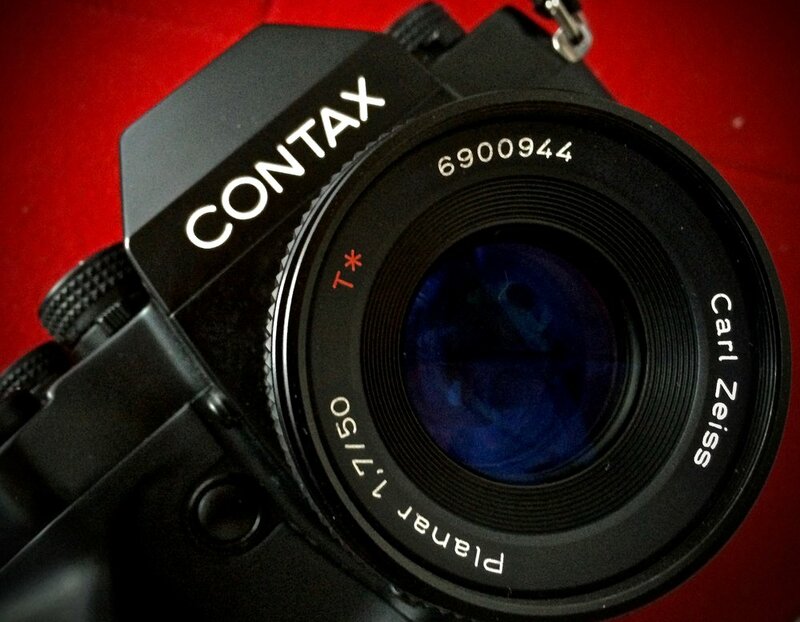 When I reached out to my Pentax friend he offered up both a chrome and black body. Of course, I couldn't resist. Here's a little secret I've never shared before. Whenever I take one of my serious photo adventures to Carmel or Yosemite or even back to New York to visit my family, no matter what other camera I bring, I always throw my Nikon FM2n in the bag as a back up. I guess I know in the back of my mind that this is just a really dependable, never let you down, simple, mechanical Nikon. I am reminded in writing this that after serving so faithfully as my trusted back up camera, the FM2n really does deserve some time of its own in the Fogdog Blog spotlight. What a delight the Minolta XD has been! Small, light and feature-packed. An amazing viewfinder--in fact the only SLR that comes standard with the famous Acute-Matte focus screen that Hasselblad owners pay big bucks to upgrade to. When I had my Hasselblad, I paid more for just an Acute-Matte screen than I did for this XD, lens and a CLA. With this camera, you get three shooting modes; manual, shutter-priority and aperture-priority. The XD accepts an affordable accessory motor drive and an really outstanding selection of Minolta Rokkor lenses. I can't believe I waited so long to try a Minolta. My only autofocus 35mm camera, the F4 is big, heavy and beautiful! I've reduced the battery configuration down to the smallest available in the MB-20 power grip and still, this is a big camera. The F4 can accommodate most every Nikon lens ever made and is packed with features I'll never use. Because of its size and weight, I only use it a few times a year, but could never see myself selling it. Truly a revolutionary camera that I could've never afforded when it was new! I'm shooting my LX as I write this blog post. 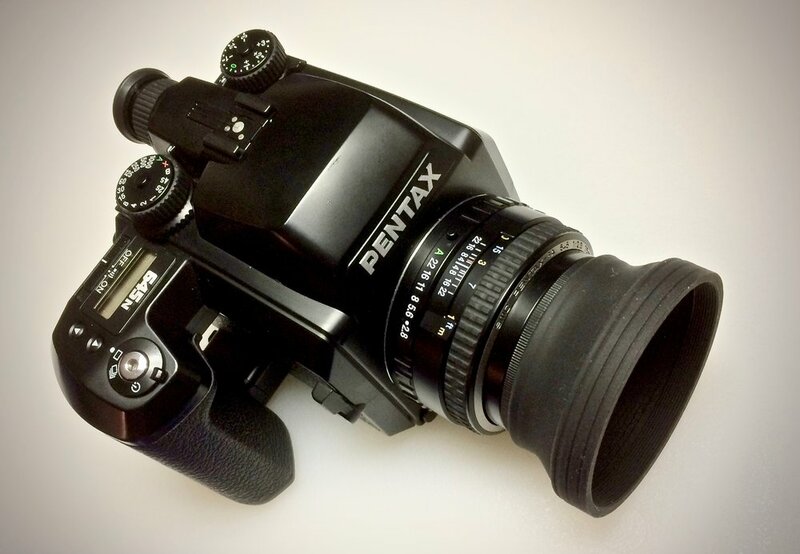 Some call this camera the culmination of everything Pentax learned after decades of building film SLRs. The LX is just the right size and weight to be the camera you carry with you everywhere. Big, bright viewfinder with a great analog display. Weather-sealed controls. Ability to use a wide array of affordable Pentax K-mount lenses. The only negatives are high repair costs and a very weird strap lug arrangement that causes your camera strap to twist up as you carry and use the camera. If your LX stays healthy and you don't mind untwisting the strap occasionally, this camera just might be one of the best film SLRs ever! As a photographer who loves small and light cameras, finding a good fit for me in the medium format world has been difficult. I've tried Rolleicord, Mamiya 645 and Hasselblad. I'd about given up when I was offered a Pentax 645n at a good price. 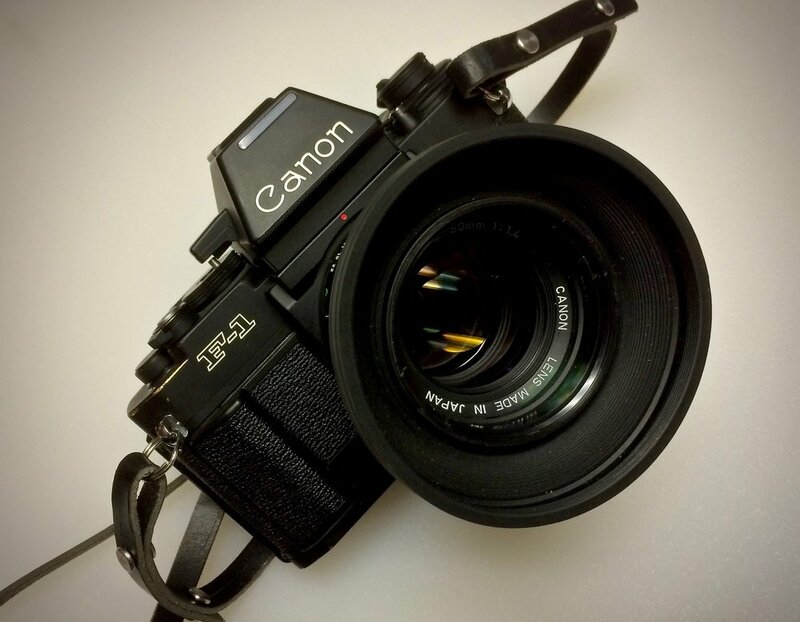 Of all of the medium format cameras I have tried, this one handles most like a 35mm SLR. Its built in grip makes holding the camera comfortable. Without the option of a removable film back, Pentax created a smaller and lighter package that just feels right to me. The viewfinder is big and bright. You get several shooting modes plus an auto-everything mode that turns this Pentax into a medium format point and shoot. And the 645n can use autofocus or manual focus lenses. I have an autofocus 80mm lens and focus is fast and precise. I need to use this camera more. There are more cameras on this list. Like my lovely little Pentax ME, my nifty Canon P rangefinder, Pentax ES, the Canon A-1 that I'm still finding my way around, Minolta XE-7 with its sublime shutter sound, and my Pentax K2 that's off for a CLA. EXPERIENCE: As I become a more competent photographer, certain cameras that seemed complicated now are intuitive. The Nikon F4's controls at one time looked like the space shuttle cockpit. Now, everything makes sense. Feeling comfortable with your equipment makes you want to use it more. A camera that seemed overly complicated can become a favorite once you know your way around it. When I first used stop down metering in my Spotmatics, it seemed like a real pain. After shooting a few rolls, it became second nature and even helped me fine tune my depth of field. LOCATION: A long day on the trail makes a small, light camera a must. Easy film loading is good too. While my Contax RX might be a favorite for a short stroll on the beach, the Pentax ME, MX, Olympus OM-2n or Minolta XD will feel better on a six mile hike. LENSES: Sometimes the camera body is secondary and it's the lens that shifts a camera into favorite position. If I have an itch to shoot 85mm, I only have two choices: Nikon mount for my 85mm f/1.4 or M42 mount for my 85 f/1.8 Super Takumar. Some lenses really sing when shooting black and white like my Canon LTM 50. That lens will only fit my Canon P or my Leica M-P with an adapter. And the only telephoto lens I have is for Pentax K-mount. MY PEERS: Once in a while, one of my favorite bloggers will write about a camera I also own and share some of their photos and it'll inspire me to get that camera out of the camera bag, check the batteries, load some film and go out and shoot. I've also been inspired after watching a user video on You Tube. If anything I write here ever inspires anyone to get out and use their camera, it's all been worth it.